7:44. Templario pinned Audaz after a powerbomb. 3) Okumura & Sansón b Atlantis & Atlantis Jr.
10:16. Okumura pinned Atlantis Jr. after a spinning DDT. This was Atlantis’ debut. 8:37. Caristico used La Mistica to submit Volador Jr. The kickoff show for Fantastica Mania tour took place earlier today. I set my alarm to watch it, but my brain decided I really needed the sleep more. I’ll watch it later and maybe get a recap up before the usual Friday night show. I did find time to see the Atlantis Jr. debut already. He was better than expected, at the level of a second/third match guy in his debut, maybe a little bit better than what we’ve seen of Hijo del Villano III so far. Atlantis Jr. showed only his father’s offense in his debut, which is going to make him look a little too retro for 2019, but it is also only one match. The results are the usual tour opening stuff, with the rudos getting the early wins and finishes setting up matches later on. Namajague did acknowledge on Twitter that he lost this mask to Stuka & Rey Cometa long ago, but is wearing because he likes and wanted to get into the spirit of the tour. That’s for me the difference with this year’s tour: it’s a general lucha libre themed set of shows rather than a CMLL dream match factory. It feels like it should be going the other way – NJPW fans probably saw more CMLL this year than ever with all of the broadcasts on NJPW World – but this is more about the novelty of seeing Fujin and Raijin wrestle in masks (which they never really did in Mexico.) They know the NJPW fans better than I. There are Fantastica Mania shows on Saturday/Sunday/Monday. The next streaming show is Wednesday morning. Hiromu Takahashi posted a video of what appeared to be him watching a recent Dragon Lee match inside Arena Mexico. Dragon Lee talked about Takahashi definitely coming back after his match today. This feels like a tease to a match before long, though maybe that’s wishful thinking. CMLL continues on without the 20 wrestlers in Japan. 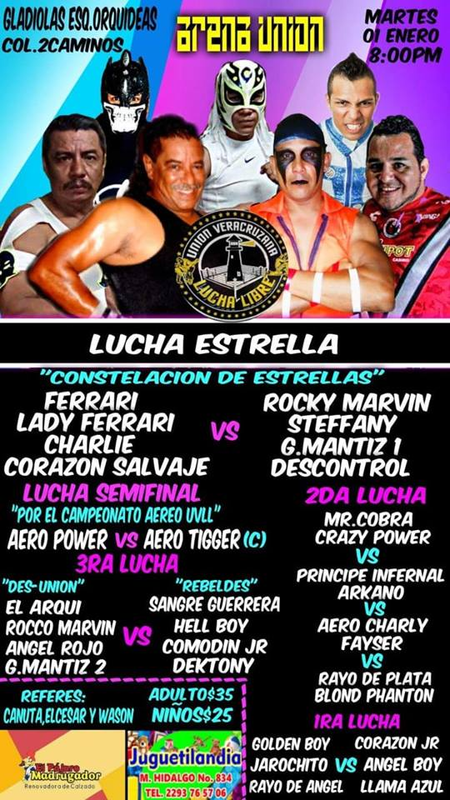 CMLL has enough wrestlers, talented wrestlers, that they could still put together interesting lineups. That would take more effort in programming than CMLL usual provides, and it appears they’re providing two weeks of filler shows instead. Tonight’s main event is Euforia, Niebla Roja and Valiente against La Bestia del Ring, Rush and Villano IV. CMLL is treating that match as if it is the only thing that could main event shows, running variations of it Saturday in Arena Coliseo, Monday in Arena Puebla, and Tuesday in Arena Coliseo Guadalajara. It’s not a rivalry or any issue – what feud there is between Euforia and his partners. Maybe Euforia throwing out a challenge to Ultimo Guerrero (among the people he’d like to have a singles match with) is going somewhere, maybe it’s a late substitute for Diamante Azul, or maybe CMLL doesn’t think enough of the remaining tecnicos to put any of them in the main event spot. Could be a combination. Kraneo & Volcano again team up with Stuka against the Hijos del Infierno. Blue Panther, Rey Cometa, and Triton are a promising trio if they weren’t wrestling Mascara 2000, Rey Bucanero and Shocker. Polvora & Felino meet in a rudo/rudo lightning match. Drone, Esfinge and Guerrero Maya take on Kawato, Sagrado, and Tiger in the most promising match of the night. Cancerbero & Raziel team up with Disturbio to face Robin, Star Jr. and Super Astro in the opener. CultIcon has a preview of the show. It’ll air at the usual 8:30 pm mark on Marca and Facebook (no link yet.) I’ll probably stream the show on YouTube. Tonight is also the first of two Impact tapings in Fronton Mexico. It seems like the more interesting show of the night They taped four weeks of TV last time around and probably will do again. The shows should start airing around 01/25. (Impact moves to Friday starting tonight and is streaming on Twitch, but they won’t be streaming these Mexico City shows quite yet.) I expect a better turnout this time, there’s really not any strong wrestling competition like last time. Add Psycho Clown & Aerostar to the list of AAA people saying they’ll be on the Impact taping. The standout matches on the last set of shows were the trios matches featuring AAA/indie talent, and I hope they sneak thru a few more of those as well. For what it’s worth, this twitch stats site has TripleMania peaking with 35,247 viewers on their Spanish language channel. I think Impact could top that tonight, but I’m not really sure. Lucha Underground put Season 1-3 DVDs for sale on their site on December 18th. 24 days later, they’ve gotten around to promoting them with a tweet. I have so much confidence in this group locking down their necessary TV deals in timely fashion. So much. Puma King & Barby’s videos have returned with DDT footage and a lot of Sammy Guevera. Durango Kid has started a Go Fund Me for his brother Histeria, who is said to have suffered a heart attack. Aerostar makes his MLW debut on 02/02 in Philadelphia, facing Rey Horus. An interview with seven-year-old Veracruz luchador La Jarochito. I feel like that’s a little too young. He’s really on the posters. 3) Drone, Pegasso, Stigma vs Kawato San, Misterioso Jr., Universo 2000 Jr. The non-Rush main event is the Kraneo/Volcano main event. Which is not a great alternative. No one else can headline, apparently. I try to make sure to write about at least one match one every B-show and I have no idea what match I’d want to see from this bunch. May take Sagrado/Tiger just to make it quick. Even the women’s sides seem not as strong as usual when they’re running out the Comandante/Seductora/Tiffany team. Still no sign of Fuego. Seeing Signo there reminds me that Yago, Akuma, and Camorra have all not appeared since their double apuesta match either. Yago was said to be hurt and Camorra may be finished up, but no idea on Akuma. First Sangre Imperial match in nearly four weeks. I know you missed him. 5) Brian Cage & Pagano vs Joe Lider & Texano Jr.
There’s nothing here that couldn’t have been announced a few days ago, it is not immediately clear why this wasn’t announced at the press conference on Tuesday. Matches 1 and 2 should be pretty good. Lanzelot was on the rudo side last time we saw him (back in November); there was no turn or explanation, but at least they’re consisent. Poder del Norte versus Jientes del Aire should be great. Random update, impact peak was 10422.